Let’s start by identifying what I mean by a “best practice”. These are things that marketing gurus and experts spout like their gospel. To be fair, it includes a lot of what I write on this blog. And best practices are best practices because they have been shown to generally work more often than the alternative. So someone just starting out in a given area, should find out what the best practices are for that channel or discipline. 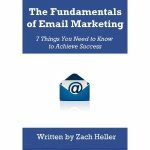 For example, if you’re new to email marketing, you should seek out common trends in subject length, email design, etc. But best practices are not gospel. They are not always best. That is the dirty little secret that marketing consultants trying to sell you on their methodology do not want you to hear. The best thing to do in any situation is test. Instead of trusting your instinct, trusting the gurus, or placing your trust in the lord, simply trust that a real-life test will tell you what your customers prefer. Nothing drives this point home more than the work the good people over at MECLABS do day in and day out. Their Marketing Experiments team is responsible for busting more myths than Jamie and Adam. They offer free research and test results, including frequent webinars on subjects from conversion analysis, landing pages, email marketing, and more. One recent test they did showed that in many cases, more text on a landing page was better than less. No guru would ever tell you to add more text. And that is why you need to test!